I have been in the restaurant industry for the past six years. I’m relatively new to wine as it is just for the last three years, that I have been employed as restaurant Sommelier. I consider Giancarlo Cuccuru (Assistant manager and formerly Head sommelier at the Marcus’ Wareing restaurant “the Gilbert Scott”) and specially Gabor Forth (current Head Sommelier at Hakkasan Hanway place) my mentors when I was starting out at this intriguing world that is wine. Basic understanding of the different styles of wine and food and wine pairing are the key when it comes to successfully develop the skills of a top sommelier, as it is also having a strong background in hospitality and customer service. Knowing your product inside out is a must. 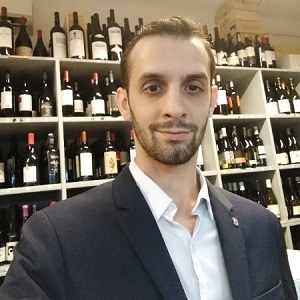 I really enjoy working with Miguel Gomez (Head Sommelier at the Typing Room and Wine Director at the Town Hall Hotel) the philosophy of his wine lists and his unusual approach to wine and food pairing is an inspiration to experiment with new things in the ever evolving world of wine. When you decide to start a career working as sommelier or in wine sales, is very important to dedicate a fair amount of time searching for knowledge, look for a place to work where your formation is considered an investment for the company and pay them back with commitment and hard work. You should approach guests with the intent of understanding their priorities, wants and needs and look for opportunities to fulfill and exceed their expectations. Glasses are important when it comes to wine enjoyment, at the Typing room we work with different shapes of glasses to adapt to the characteristics of each wine. Riedel is our brand choice due in part to a commercial agreement with our provider. Listen to your palate above all else, but keep in mind the cooking method when pairing food and wine. Consider not only the regional pairings but also think outside the box and be adventurous enough to try wines you are less familiar with. When creating a wine list for a restaurant the most important task is to honour the kitchen efforts, keeping in mind market needs and the financial reality of the business. It’s important to establish an extensive network of contacts and associates (as well as a few friends along the way) when working within the compelling and exciting wine industry. The wine industry is always changing, it’s important to keep an open mind and be willing to try new “exotic” things and to understand how the market is evolving. Work with suppliers that keep you up to date with the last releases and exciting opportunities. Marketing is an important tool to get the attention of wine professionals, but quality must be the ultimate goal of any producing wine estate if it is to reach the most exigent wine list out there. If it looks good and tastes good chances are customers will enjoy the wine and share their experiences with their relatives and friends. If I had to pick a varietal to be I would be a Nebbiolo grape, nervy and aggressive in youth but developing into a complex and harmonious character as it ages and very representative of the “terroir” it comes from. The top three wines I really get excited about at the moment are the wines of Piemonte, Washington State experimental plantings and the white wines of Valdeorras DO from the Godello grape. Ice Wines from China and Hungary are my highlights when we talk about sweet wines. Wine Gang, Decanter and wine spectator are all good publications and I highly recommend to join the Guild of Sommelier to stay informed as it’s for me the best online platform for wine professionals.